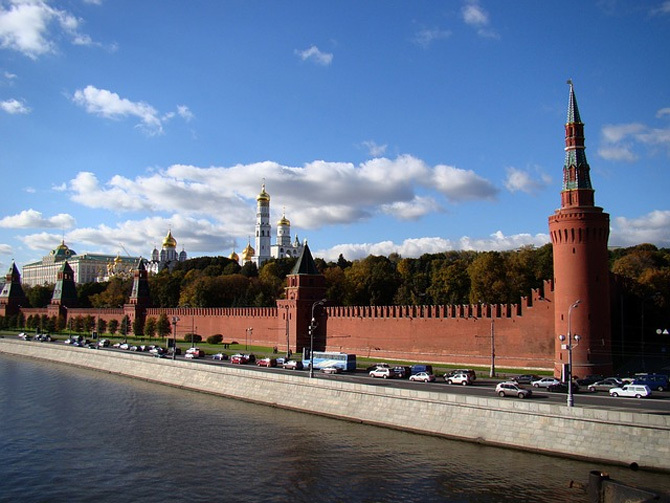 Kremlin is the very heart of Moscow and probably the best place to start discovering the city. Being the actual birthplace of Moscow, Kremlin has the richest history, lots of stories to tell and a lot of beauty to show. It has been a residence of Russian rulers for many centuries and today it is the seat of power of the Russian government. 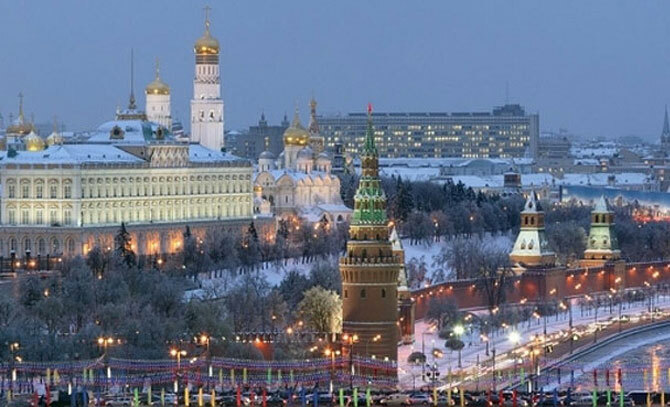 In spite of this important status Moscow Kremlin welcomes tourists from all over the world and reveals its cultural and architectural treasures. Among them are: the Armory Chamber, Cathedral of the Annunciation, Cathedral of the Archangel, Cathedral of the Assumption, the Patriarch’s chambers, Church of the Deposition of the Robe, Ivan the Great Bell Tower, Sobornaya Square. 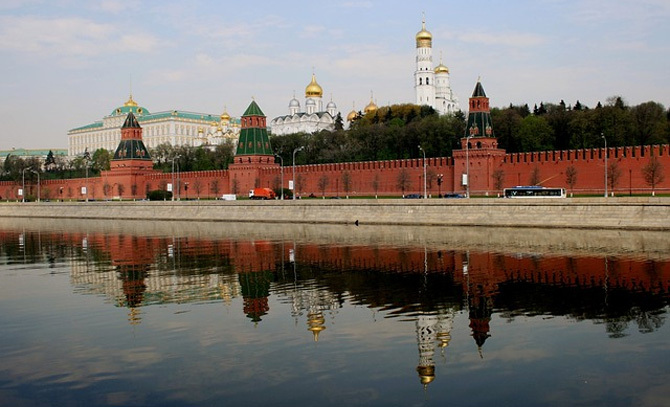 Moscow Kremlin is on the list of UNESCO worldwide heritage sites. 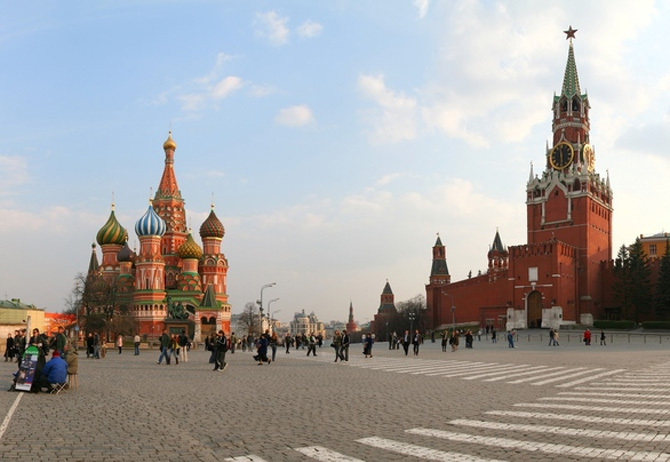 Red Square is another must-see in Moscow and another part of UNESCO worldwide heritage. It is probably the most popular sight in Moscow, and not without reason. In the Red Square you will see and feel unique variety of styles and historic epochs. Explore the ancient Kremlin – a symbol of the Russian state and a treasury of amazing relics and monuments. Admire the beauty and architectural magnificence of the world-famous St. Basil’s Cathedral built in the 16th century. See how all of that is adjoined by the weird constructivist building of Lenin’s Mausoleum. Learn more history with a great collection of artworks presented in the State Historical Museum. Enjoy some window-shopping in the glorious GUM department store. Spare a silent moment in front of the “Eternal Flame” and the “Tomb of the unknown soldier” in the memory of the fallen heroes of the WWII. Watch the traditional change of guards of this monument. Enjoy some relaxing moments and people-watching in the beautiful Alexander Garden. The Theatre Square which is located pretty close to the Red Square got its name not accidentally. 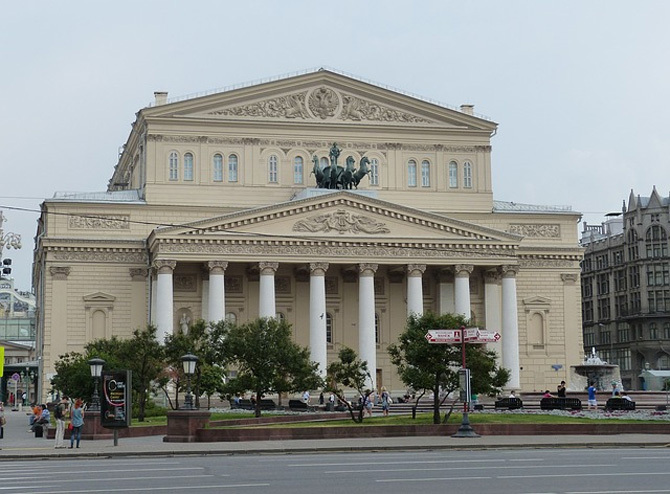 There are three theatres located here: Bolshoi Theatre (which literally means “The Big Theatre”), Maly Theatre (translated as “The Small Theatre” and Russian Academic Youth Theatre. The world-famous Bolshoi Theatre is another symbol of Russia and a true pearl of the world’s theatrical life. 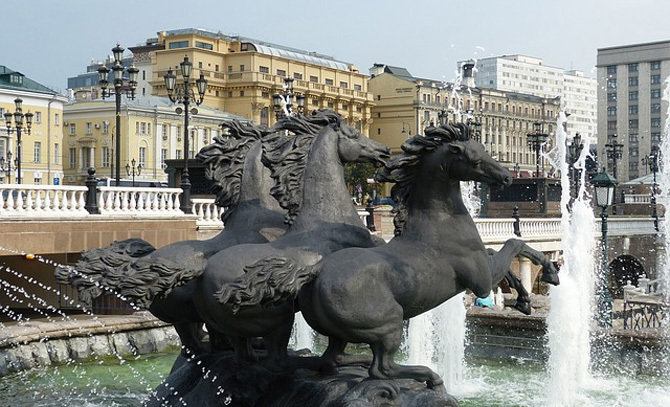 Bolshoi has a rich history and plays an important role in the Russian culture today. Also on the Theatre Square you can admire the beautiful 19th century building of TsUM – a high end department store. On the other side of the square there stands a remarkable example of early Art Nouveau architecture – Metropol Hotel. When in Moscow make sure to visit this holy place with magnificent external look, glorious interior and fabulous dramatic history. 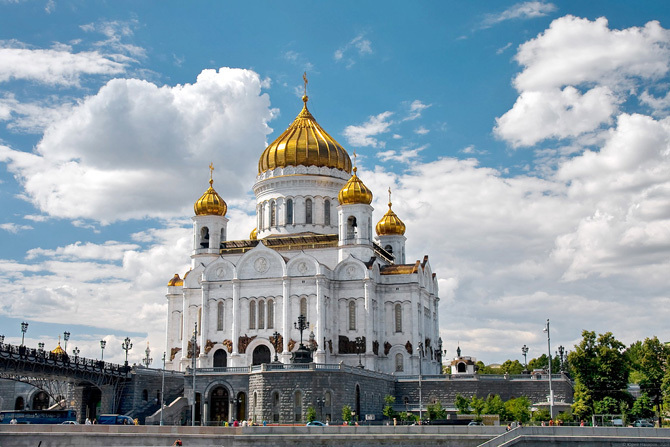 One of the largest Orthodox churches in the world, Cathedral of Christ the Saviour was rebuilt in 2000 reproducing the original demolished in the Soviet period. You might also take a chance to admire the panoramic view from the 40-meter-high observation platform. As an additional bonus, enjoy some amazing views over the Moskva River from outside the Cathedral’s back door. 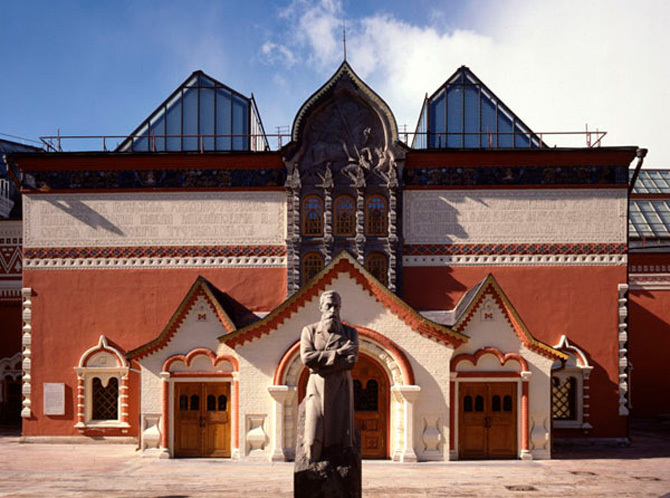 Famous Tretyakov Gallery features a unique collection of Russian art and masterpieces of different epochs, including ancient Russian icons and outstanding works of pre-revolutionary Russian artists. It is a great place to discover treasures of the Russian art. Moreover, the very area where the museum is located is one of the most pleasant for Moscow walks. It’s called “Zamoskvorechye”, which literally means “beyond the Moscow River”. 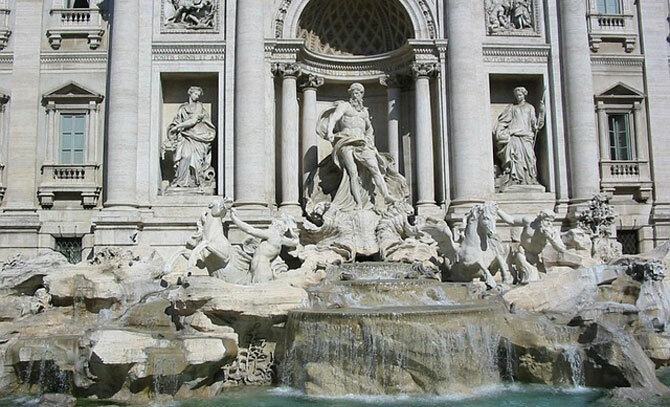 It is a historic area full of colorful churches, interesting museums, small gardens and parks. Don’t miss the chance to walk along those charming old Moscow streets. It might sound strange to have a metro on the list of top attractions. However, the Moscow metro is much more than just a mean of transport. Being Europe’s busiest metro system, it also features unique architecture and cultural highlights. 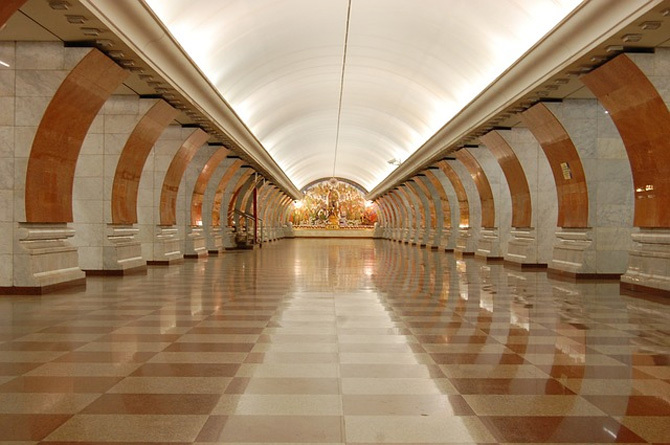 To understand why the Moscow metro stations are called “underground palaces”, just visit some of them, especially Majakovskaya, Revolution Square, Kropotkinskaya, Komsomolskaya, Novoslobodskaya. Some of the stations are protected by the state as valuable cultural objects. Sparrow Hills (Vorobyevy Gory) is one of the highest points in Moscow. 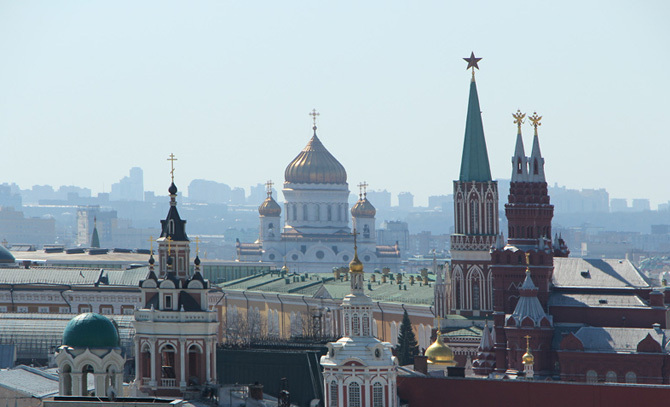 Thanks to that it has an observation platform with one of the best panoramas of Moscow. From here you can observe the huge scale of the city and of course take some gorgeous photos of Moscow. Besides, Sparrow Hills is a huge beautiful park, national nature reserve, popular spot for picnics and various outdoor activities and a meeting place for Moscow bikers and street-racers. You will also be impressed by the building of the Moscow State University (MGU) – the main and the most famous Russian university. It’s a symbol of Russian science, and an outstanding example of Stalinist architecture. Also it is known as one of the tallest educational buildings in the world: the university’s highest section is 36 floors and 194 meters tall. 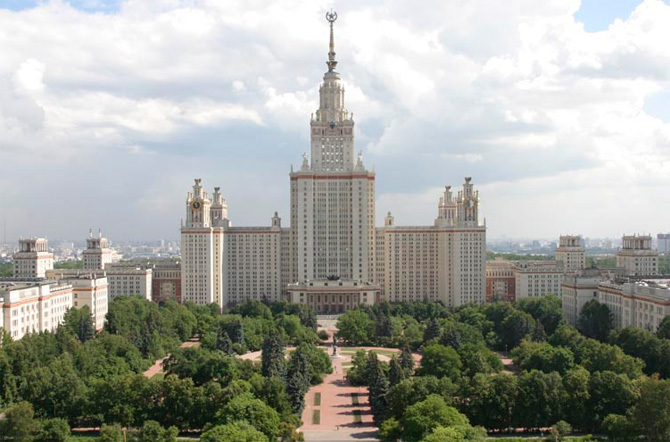 The main building of the Moscow State University is one of so called “Seven sisters” of Moscow. This sweet name was given to a group of seven skyscrapers in Moscow designed in the Stalinist style. Moscovites call them Stalin’s high-rises. 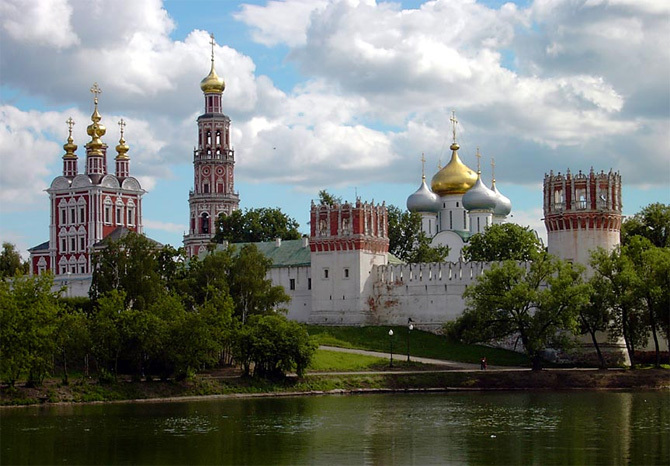 The Novodevichy Convent is a glorious monastic ensemble built in the 16th and 17th centuries. This place will please your eyes as well as and your inquisitive mind with beautiful architecture representing the so-called Moscow Baroque style, rich and distinctive interiors, interesting collection of paintings, fabrics and artifacts and fabulous stories behind all of that. Being a monastic place, it also played an important part in the political, cultural and religious history of Russia. After visiting the convent allow yourself a peaceful walk in the park around it. This unique historical and architectural complex was founded in 1939 to advertise and demonstrate achievements of leading Soviet industries. The Russian abbreviation VDNH stands for The Exhibition of Achievements of National Economy. As you can imagine, it was an important platform for ideological activity of the Soviet government. The VDNH complex is a magnificent sample of Soviet architecture and landscaping. Today it is a huge open-air recreation complex that includes many architectural masterpieces, large and small parks, fountains and diverse amusements. Once you are at VDNH, don’t miss the chance to see the interesting sights nearby. One of them is Moscow Memorial Museum of Cosmonautics that displays the history of space exploration. Its large exposition showcases space technology and features interesting gadgetry and interactive exhibits. Don’t miss the chance to explore the Cosmonaut Training Center simulator or virtual international space station. VDNH is also the right place to see the tallest structure in Europe – Ostankino TV Tower that houses the studios of nearly all the major Russian TV channels. If you visit the tower, you can also enjoy great panoramic views from the viewing platform situated 340 meters above the ground. 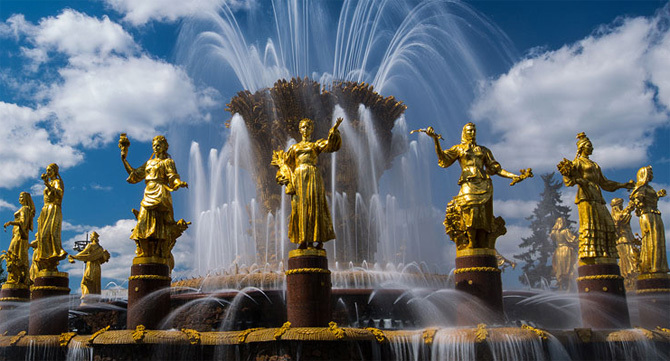 Gorky Park that stretches along the Moscow River is a famous leisure and cultural site of Moscow. 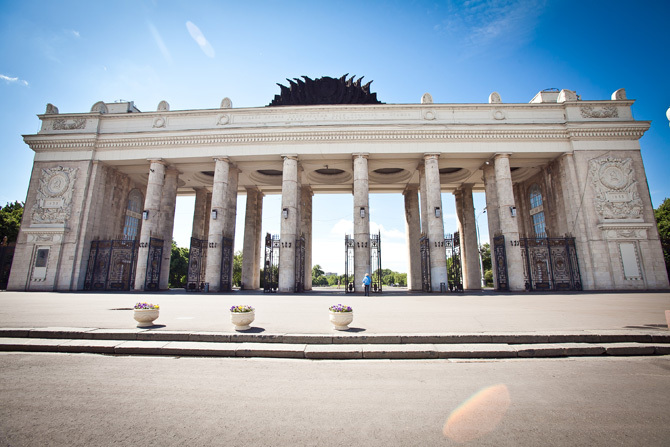 Opened in 1928, it has been for years one of the main leisure spots for Muscovites and a legendary place for tourists. After a major restructuring in 2011 the park got a fresh appearance and plenty of highlights. The renovated park features an outdoor movie theatre, the observatory where you can look through the telescope while listening to fascinating stories from astronomers, a comfortable business area with Wi-Fi, numerous open-air cafes, bike rental stations, yoga classes, film festivals and open-air music performances in summer, open-air ice skating area in winter. Gorky Park is a good place to watch the locals sparing their free time and having fun, to walk around beautiful surroundings and get some rest from the Moscow rush, to spend some lazy time in one of trendy cafes, to get a distinctive “Soviet style” ice cream cone, to take some sport activities or enjoy open-air performances. Among other features Gorky Park has a viewpoint on top of the park’s gates.